Summary: New U.N. member South Sudan has been admitted into the African Union, the continent's highest level intergovernmental organization. Formal recognition from individual countries is still continuing. this map by Wikimedia user Heraldry (CC BY-SA). 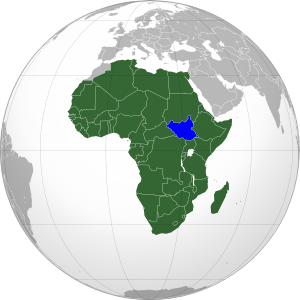 Less than three weeks after declaring independence, the new Republic of South Sudan has been admitted into the African Union (A.U.). The A.U., which represents all of Africa's countries except for Morocco, voted with a majority in favor of allowing South Sudan's entrance into the organization. Membership will allow the new state to participate fully in the community of African nations, while the A.U. is soon to begin mediating talks over the remaining disputes between South Sudan and Sudan, the country from which it seceded this month. 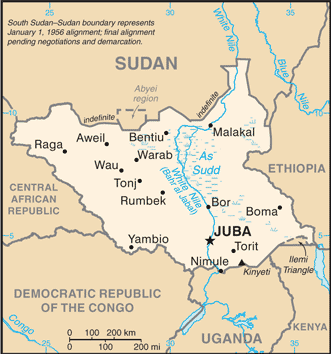 South Sudan is the 54th member of the African Union, and the first new member since Eritrea joined in 1993. In addition to A.U. and U.N. membership, South Sudan has continued to receive recognition from individual countries. Official statements of recognition for the new country have now been released by 97 U.N. members and six other sovereign states. 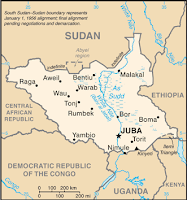 Ninety-five U.N. member countries have not yet formally recognized South Sudan, but none have opposed it's independence - an indication that they all intend to accept it as the world's newest sovereign state.